Click on event title to learn more or to register. Participants will learn to read and pronounce the letters of the Hebrew alef-bet. In addition familiarity with the prayerbook, basic blessings and core parts of the liturgy will be provided. Organized by our youth group, SITY, and led by Shoshanah Alessi, we invite you a meal and presentation as the next generation learns about the Holocaust and connects with our community. Dinner included. 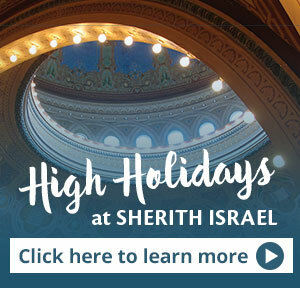 Welcome Shabbat with delicious Israeli food, a story that imagines traveling around Israel and special conversation starters for adults at each table. With Rabbi Samantha Kahn, Rabbi Jessica Graf, Cantor David Frommer and families with children ages 5 and under. Please join us for a celebration of Rabbi Larry and his contributions to Sherith Israel, American Jewry and San Francisco. Rabbi Larry. “Yes, We Sang!” is a concert/sing-along, featuring songs that were popular among communities that were decimated in the Holocaust, and songs dedicated to them. Join us for a Salon with Rabbi Ed Feinstein of Valley Beth Shalom as part of our year-long series on Democracy and Resistance. Kinspace is exclusively offering McMoyler Method™ prenatal classes, providing expectant parents with all current best practices and options for any type of birth.